PowerMate and PowerMate II are all natural supplements containing diatomaceous earth for brood cows, stocker cattle/bison, and goats. PowerMate lick blocks are designed for essential fortification of vitamins A, D and E, macro minerals and trace minerals. 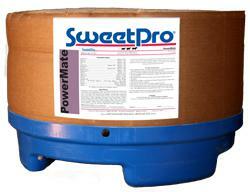 They also serve as a vehicle for intake of diatomaceous earth and are similar in performance to the SweetPro16. Sold in 250lb lick tubs and in bulk. The benefits from our blends of ingredients and advanced processes, supports animals that grow stronger, faster and avoid many of the health problems with which bison, cattle, elk, goat, horse, sheep and yak owners traditionally have struggled. 1 .SweetPro blocks use Condensed Distillers Solubles with much higher protein and nearly 10 times the fat as molasses, plus enhanced aroma and palatability. 2. Energy in SweetPro blocks comes from complex carbohydrates instead of the simple sugars of molasses. This supports resistance to digestive disruption from sugar and starch (No Negative Associative Effect) digestion on the microbial populations which digest fiber in the rumen, keeping rumen pH high for health support. 4. The safe, protein sources of SweetPro blocks include high rumen by pass ingredients to give calves, cows, bulls and goats an extra boost. No Urea in any of the SweetPro products. Daily intake will vary depending on forage quality and nutritional needs. There may be a load period whereby animals will fill in their nutritional gaps, but should level out after one or two tubs. If consumption exceed 1.75lbs per head per day step up to the Powermate II. Consumption levels vary depending on the time of year, weight/condition of cattle and forage conditions. After adaptation period, cattle/bison consumption will be approximately: yearlings 0.50 to 1.25 lbs. per day; cows 1.00 to 1.75 lbs. per day. If intake of PowerMate exceeds 1.75 lbs. per day, switch to PowerMate II. One tub per 25 head of bison. Place away from water source. Tubs can be space fed. 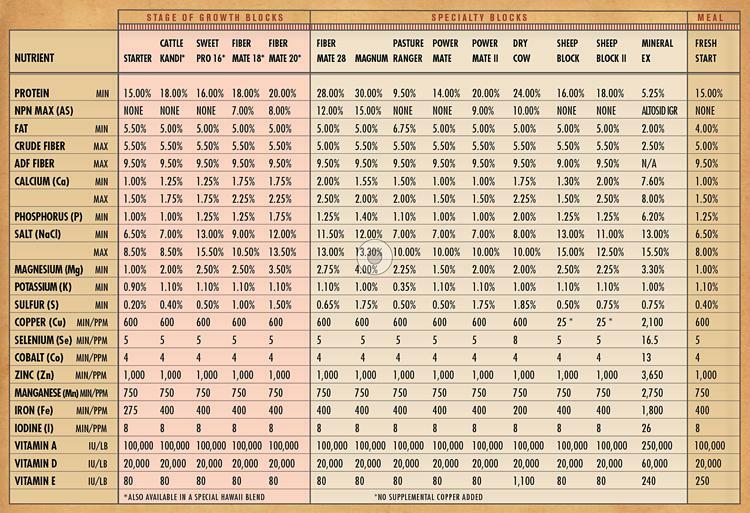 Place the appropriate number of tubs with the desired group of bison assuming a consumption rate of 1-1.5 lbs. of product per day. For example, if the tubs are expected to last 7 days, then don’t place new tubs in pasture or feeding area until this day has been reached. The product will stay in the animal’s system for multiple days even after the feed is gone. Omega 3 fatty acid, Min.